What was a Kelpie’s prized lamb dinner turned into a winning product for Nulla Vale lamb farmer Toni Barton. This enterprising creator of Lamb Bacon displays all the attributes of a typical entrepreneur. Some would say she is driven. Ideas are explored, problems solved, and opportunities taken. At the core of it all is Toni’s deliberate life-choice, to trade in an international marketing career for that of a hands-on farmer producing good quality meat. Mondays aren’t Toni’s favourite day. She has a load of lambs to deliver to the abattoir. This is a task that she personally undertakes each week. Another day she didn’t enjoy was discovering twenty dead and injured sheep in the paddock following a dog attack. ‘It was one of the most traumatic experiences of my life,’ she confides. Welcome to the life of a farmer. After a lot of soul searching, in 2016 Toni gave up her international lifestyle in corporate marketing to reinvent herself as a farmer. In preparation for the transition, she had purchased 60 hectares of prime grazing land at Nulla Vale near Lancefield and converted three big paddocks into 15 smaller ones for rotational grazing. She set it up as a three-tiered business – breeding and selling Australian White stud rams, producing lambs, and selling lamb meat products. In her first year she processed 16 lambs for meat which was sold to family and friends. The following year it was 30 lambs. Four years on as a full-time farmer, she is processing 600 lambs annually with a profit of over $200 per lamb sold through customer centric distribution channels including online and Farmer’s Markets. Such has the demand grown for her meat that she is now collaborating with four select sheep farmers who have taken on her breeding rams and share the same farming ethics of grass fed and animal husbandry. ‘One hundred percent grass fed and no chemicals,’ Toni explains. As a result, she has regular cutting and mulching of the paddocks on her long list of chores. She also makes a point of paying premium prices to her fellow farmers, so they can maintain their sustainable farming practices and avoid the pressures of mass production and grain feeding regimes. But it was her creation of the iconic Lamb Bacon in 2016 that really put Toni in the public eye, drawing close scrutiny from the Prime Safe authority and, just recently, winning her The Weekly Times Shine Award. On long road trips she would constantly challenge her brain to think of something new. And she did. Who would have thought that bacon could be made from anything but pork? Experiments with her American friend and BBQ Pitmaster, Jon, meant that she could road test flavour profiles and cooking techniques. ‘As soon as I tasted it, I knew I was on to something,’ Toni smiles. Samples were shared with regular customers and some high-profile chefs readily endorsed it as a great alternate to traditional bacon made from pork bellies. Toni fully understood her obligations of food safety and microbiological testing to ensure her duty of care to consumers, but with a new innovative product hitting the market there are many negative attitudes encountered. Top of the hurdle list would have to be a sudden directive from the Prime Safe, which regulates Australia’s meat industry, to immediately shut down production and recall all her Lamb Bacon products from sale. ‘I just sat in the paddock in total disbelief,’ Toni admits. She immediately rang her smokehouse instructing them to stop production but the ramifications of recalling hundreds of products already on supermarket shelves was catastrophic. Moving into problem solving mode, Toni fought back the emotion and focussed on the process. Overnight she read through the Food Standards Act and researched the topic globally. She was able to determine that no one species, ie. pork, was defined as bacon in Australia. In the early hours of the morning she sent a carefully composed email to Prime Safe outlining all of her findings. Much to her relief, a phone call from Prime Safe a few hours later reversed their decision and congratulated Toni on her initiative. Transferring her skills to farming and food production has required considerable research. An intensive 14 week accelerator program enabled her to become more strategic. As part of her start-up process she set up an advisory board of skilled and experienced professionals to offer her valuable guidance. Her marketing skills allowed her to set up a website to sell direct to the public and social media to publicise her products. Recruiting quality staff and paying attention to detail have also been crucial. All Toni’s skills have come to the fore in 2019 as she launches a new enterprise – Barton’s Smallgoods - to export new products to the Middle East and Asia. Rebranding was required in 48 hours as she prepared to fly to Dubai in February to participate in the Worlds largest food conference, Gulfood, as part of the Victorian Government’s Trade Mission. Currently she is commissioning a new smokehouse and packing facility in Geelong, as well as employing staff to run the export business. Already there are considerable orders with shipments scheduled to commence in late April. Toni admits that it can be lonely at times, but so far she has resisted taking on a business partner or a commercial loan. Her number one supporter until her death last year was her mum. She is particularly grateful to her dad who is called upon to do important jobs around the farm and neighbours who are always willing to help out. A Producer Led Innovation grant from Meat & Livestock Australia is providing valuable assistance to research and develop her new export business in return for sharing the outcomes with other red meat producers. Her days are long and there are multiple decisions to be made while still taking care of the farm. Until her export enterprise is up and running, Toni doesn’t have any time to work in her vegetable garden or enjoy her sweeping views overlooking Mt William. But she is confident that her efforts will soon be rewarded, and she will be back where she most loves to be. READ the second part of this article on Toni’s preparing for export experiences. Looking back at how Bundarra Berkshires evolved Lauren Mathers defines it as ‘madness’ given that she has given birth to three children in the midst of becoming a free-range farmer and exemplifying the paddock to plate dream. Displaying the attributes of a true entrepreneur, it all started when she saw a problem that could be turned into an opportunity. And history keeps repeating itself. Arriving at the Mathers property near Barham in New South Wales early one brisk Saturday morning mid-winter, it comes as no surprise that bacon and eggs are on the menu. The kids are sleeping in and Lachlan and Lauren are planning their weekend ahead. No football. No socialising. Weekends are the best time for the couple to do the hands-on work required to care for their 400 plus Berkshire pigs. ‘It’s madness when I look back. I used to do it all, but Lachlan stepped in and shared the responsibilities as the children came along,’ explains Lauren. 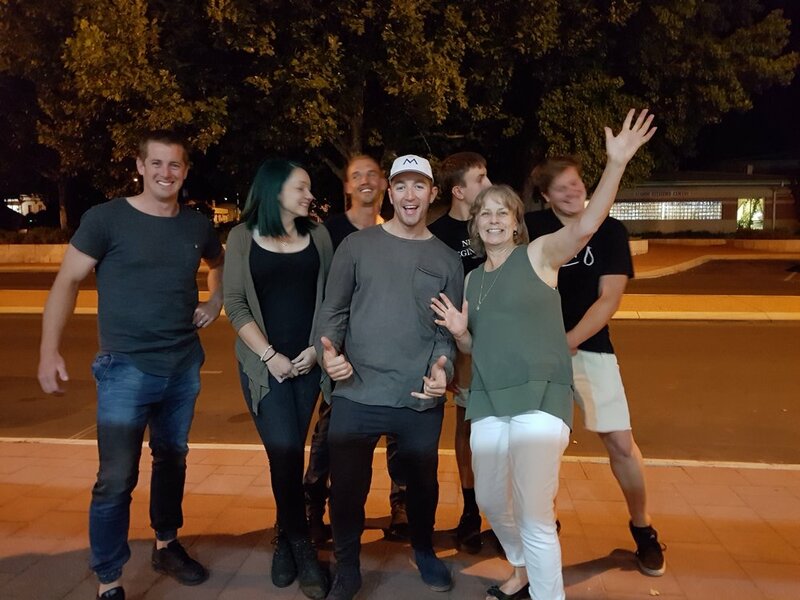 A transport driver for his parents’ company during the week, Lachlan has been pleasantly surprised at how enjoyable it has been to get involved in the business that has now built up to become their main source of income. ‘I’m trucks by day and pigs by day, night and weekends,’ he smiles. ‘Dad and husband is in there somewhere as well.’ All jokes aside he adds that he is enjoying his new role. With our plates empty I chat with Lauren over coffee as Lachlan deals with the waking kids. It quickly becomes apparent how her brain operates. Constantly. Very fast. And, there is no doubt, she is a problem solver. ‘If I think of a good idea I just run with it,’ she admits. As a partner in the successful The Long Paddock restaurant established in 2008 at nearby Koondrook on the Victorian side of the Murray River, Lauren had her first experience of small business. The restaurant’s reputation was built on an ethos of sourcing local quality foods but she was having trouble finding tasty pork. This is how Doris first came on the scene. While Doris failed to have any produce for some time, ironically Lauren fell pregnant with her first child. Undeterred, the seed of an idea just grew and grew, fuelled by a bursary as a Rural Ambassador to visit France and see how farmers there sold their produce at markets and the relationship between consumer and farmer. Eight years since establishing the herd, Lauren now has over 100 sows and 300 piglets at any given time to care for. And, for those of you who are wondering, Doris lived on despite her shortcomings, eventually passing away from natural causes. In 2011 Lauren started selling the pork and by late 2011 was selling gourmet pork products to retail outlets and at farmers markets. ‘Winning a Delicious Product Award in 2013 was a great kick start,’ she acknowledges. Bundarra Berkshires has its own website and Farm Shop page outlining products that can either be purchased at one of the listed stockists or delivered through their courier service. Hogfest, held each September, promotes the ‘paddock to plate’ concept and connect customers with their products. Social media has clearly been a winner with a healthy following on Facebook and Instagram. Quality photography assists Lauren to clearly articulate their love of animals and a rural family lifestyle. ‘There are now a lot more micro businesses operating in this field,’ Lauren admits, ‘so now we have to work hard to stay ahead of the game. Over the past two years we have been constantly tweaking our targets. Our space is clean eating so nitrate free and preservative free is where we concentrate our energy on. You have to pick an area and own it,’ she advises. While many businesses are transitioning to a lean balance sheet through outsourcing, Lauren believes that agriculture is moving in the opposite direction especially when it comes to clean, green, and ethically produced food. ‘There is too much uncertainty if we don’t,’ she explains. Keen to know her business every step of the way, she started by helping her preferred butcher at Gunbower to pack her pork products. ‘Tom showed me all the different parts and how to bone out a shoulder. Lucy, our eldest child, was in a pram at the time,’ she recalls. Soon the logistics of taking Lucy to the butchers and struggling to find other butchers to do smoking and sausages for her became stressful and time consuming. Just as their second child, Frida, was born in 2013, Lauren recognised what many would perceive to be a problem as an opportunity. ‘I decided to take control of our own supply.’ Subsequently the shed was cleaned out and a cutting room and smokehouse installed. A year after that a commercial kitchen and air-drying room was added. Before you start thinking this is all too easy, finance did prove problematic for this second phase of the business so Lauren tried out a Crowd Funding campaign by offering produce in return for advance payments to help fit out the new facilities. ‘The campaign raised more than we aimed for, but I probably wouldn’t do it again,’ she admits. To help get her started, a friend spent a day instructing Lauren on the different cuts for meat. “For the first three years I butchered on my own with a handsaw which kept costs really low.’ As the demand for product grew a butcher was employed in late 2015, perfect timing to assist with the Christmas rush and, by my calculations, to aid Lauren who was pregnant with George, child number three! ‘To begin with we used what buildings we had but we are outgrowing ourselves now.’ Another problem and/or opportunity for her to think about. In her latest quest, Lauren is part of a group of like-minded farmers in the process of establishing a local cooperative to set up their own micro abattoir. Her vision is shared with the group for it to be staffed with highly skilled personnel operating under an ethos of humane treatment of animals. ‘Offal is another big opportunity to create new products from waste and, as a cooperative, we will also be able to put back into the community,’ Lauren says with a sparkle in her eye. Much to Lauren’s frustration, problem #4 is still in the process of being turned into an opportunity as the effects of an impending drought start to make their mark. ‘Usually we are knee deep in pasture this time of the year but we’ve had no rain and we’re at the mercy of a feed company. The price of feed has just gone up $100 per tonne.’ Sourcing feed with no animal base has been quite a difficult process so there is no quick fix to this one but I have no doubt that Lauren will keep thinking on it. Expanding their 65-acre farm is one strategy and she has already sub-contracted her parents on a nearby property to grow out pigs for her. Have a clear vision of what you want to achieve and stick to it. At the same time, be aware of new opportunities to improve your business and be prepared to change and adapt. Don’t do it if you don’t love it.